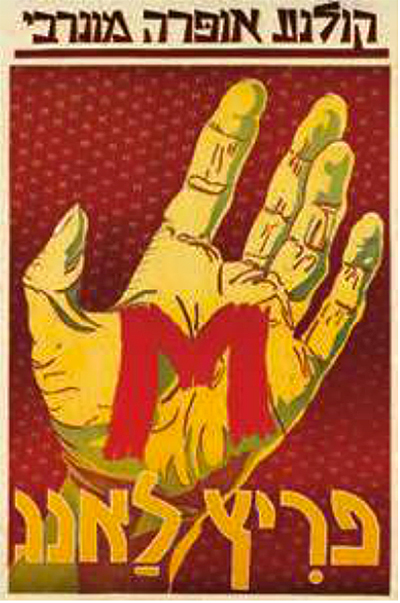 We revisit the Swann Galleries Modernist Poster sale held May 13, 2013. The linocut poster above is for the original release of film director Fritz Lang's "M" at the Moghrabi Theatre (built in 1930) in Tel Aviv. After a distinguished career during the silent film era, Lang's first talkie - considered to be his best film - starred Peter Lorre as Hans Beckert, a hunted, haunted by "this evil thing inside me" child murderer who whistles Grieg's ominous In the Hall of the Mountain King when approaching his prey. Due to the lurid nature of film's subject matter Lang, who had made his films at the celebrated and artistically influential German studio, UFA (Universum Film AG), worked with Nero Films for this movie to deflect the political pressure bearing down upon him from UFA, a government-supported entity. When sound arrived UFA routinely released versions of major films in several languages. Given that Jews were persecuted in Germany soon after the movie's release and, later, exterminated wherever Nazis found them, it is fascinating to learn that UFA felt the need to release a version in Hebrew to cater to the audience in then Palestine. It was strictly a financial decision. With the advent of sound movies and language barriers the studio could no longer depend on easy distribution and box-office receipts throughout the world. 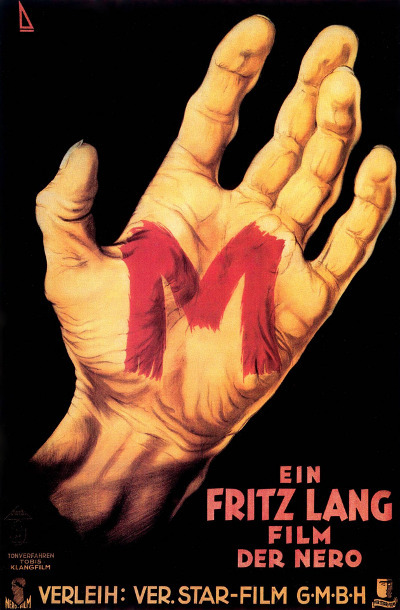 This same, stark image of a hand, emblazoned with a red "M," appeared on the original German poster but did not have the repeating motif of the letter against the background. Give Clothing For Liberated Jewry. 1945. As a Jew who had been exposed to Nazi atrocities through British war films, Abram Games (1914-1996) was in a unique position to be able to channel his horror in a manner which could potentially assist the decimated Jewish communities of Europe. 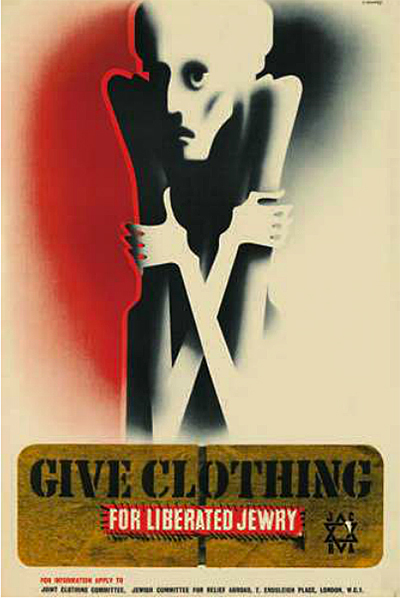 His Give Clothing For Liberated Jewry (1945) starkly and dramatically captures the desperate plight of concentration camp survivors. (Abram Games: His Life and Work, fig 219). Abram Games, one of the twentieth century's most influential British graphic designers, believed in using the simplest possible design to create the greatest possible impact. Beginning as a commercial artist, when WWII broke out he was recruited as an Official War Artist and in that capacity designed over a hundred posters, later creating the symbols of the BBC and the Festival of Britain. He experimented with "unusual juxtapositions of illustration and typography. Games strove to ensure that his wartime posters were as striking and seductive as the best commercial art. 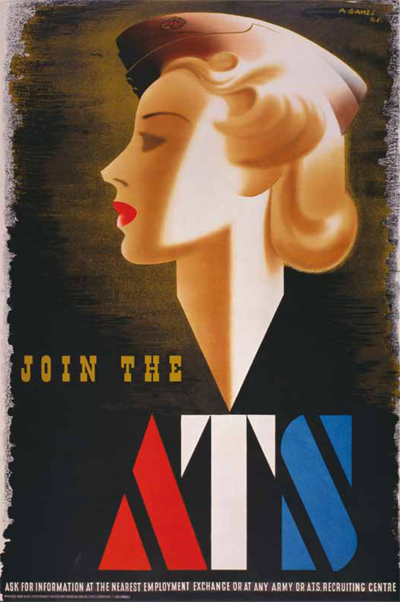 "Sometimes Games’ work was deemed too seductive, notably the glamorous ATS girl dubbed the 'Blonde Bombshell' which was criticized by the House of Commons for being too glamorous. Games favored stark, simple and, therefore, all the more arresting images produced by sticking to his philosophy of deriving 'maximum meaning' from 'minimum means'" (Design Museum). DP / Over 200,000 Displaced Jews Look To You. 1946. 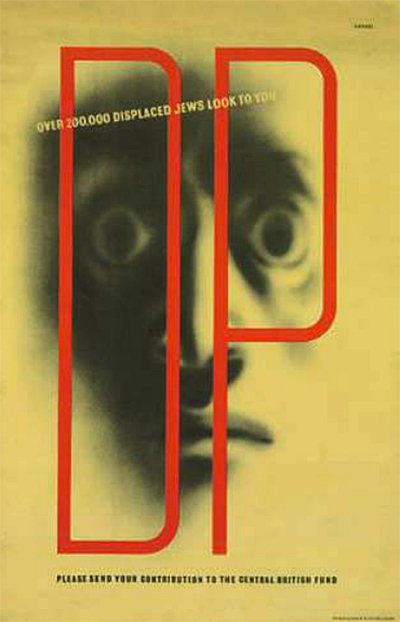 In the immediate aftermath of the war, Games designed "posters which demanded, rather than appealed to, the Jewish public to give aid to the refugees . . . [In Displaced Persons] two eyes stare out of the initials DP with an appalling urgency; the vestige of a face an embodiment of despair. The lettering underneath . . . is by contrast plain and tiny: no words are really necessary. This is Games at his most powerful" (Abram Games: His Life and Work, p. 177, and fig. 220). “All Abram Games’ designs were recognizably his own. They had vigor, imagination, passion and individuality...And he was lucky - and clever - in contriving, over a long and creative working life, to keep on doing what he did best” (David Gentleman).